Pool noodles are amazing and can be used for so many ingenious toys. As a bonus, they can be found everywhere during the summer and can usually be purchased for less than a $1 a piece. My two kids love to play fight. Their favorite activity is to beat each other up with these light sabers (and me if you’ve seen my About page). Play fighting can be so much sweeter when marshmallows are involved. 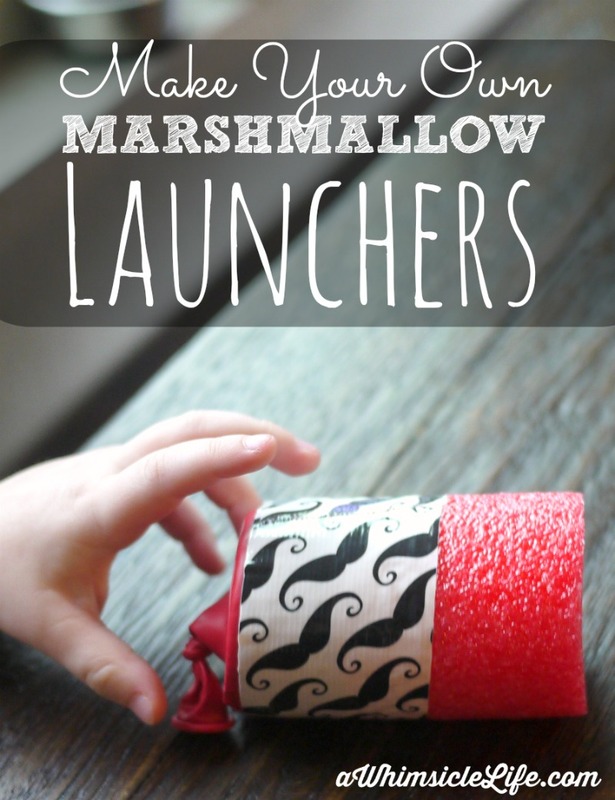 In fact, I would happily open my mouth and offer to serve as a target with this marshmallow launcher. Step 1: Cut off a 6″ long section from the pool noodle. A bread knife with a serrated edge works really well for this step. Step 2: Tie off a balloon (as you would do if it was full of air). Fold the balloon (this will make it easier) and cut off the tip. Keep the bottom half with the knot. Step 3: Stretch the balloon opening over one end of the pool noodle. Make sure it is nice and tight with little to no slack at the end. Step 4: Secure with your choice of colorful Duck tape. 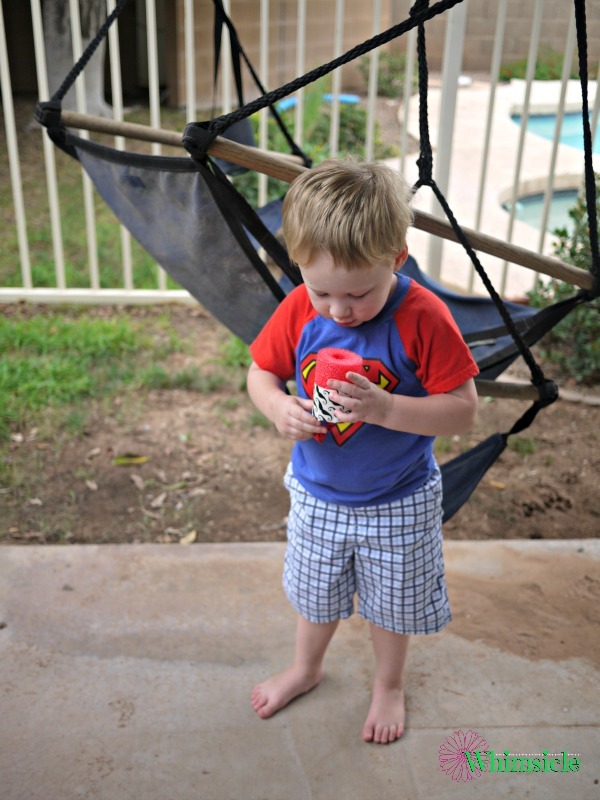 Drop a mini-marshmallow into the hole, pull back on the balloon tie, let go and watch that marshmallow fly! As a note of warning, each mini marshmallow is only good for 2-3 launches. They simply become too flat and gooey after that. I solve this problem by playing in a well cleaned area and allowing to kids to eat any defunct marshmallows. I recommend rationing the marshmallow supply before beginning because a harmless game can easily turn into a marshmallow stomach ache. Even for this mama target. I’ve learned the hard way that there is such a thing as too many marshmallows. Thank you so much AmieJo! Love this idea! And I love how inexpensive and simple it is…I love quick and easy projects! Us too! Thanks for stopping by Julie! Happy SITS Day to you! They work just as well anytime of year!! Send us pictures and we will post your Thanksgiving fun on our Facebook page! This looks like a fun and simple afternoon project for my kids! 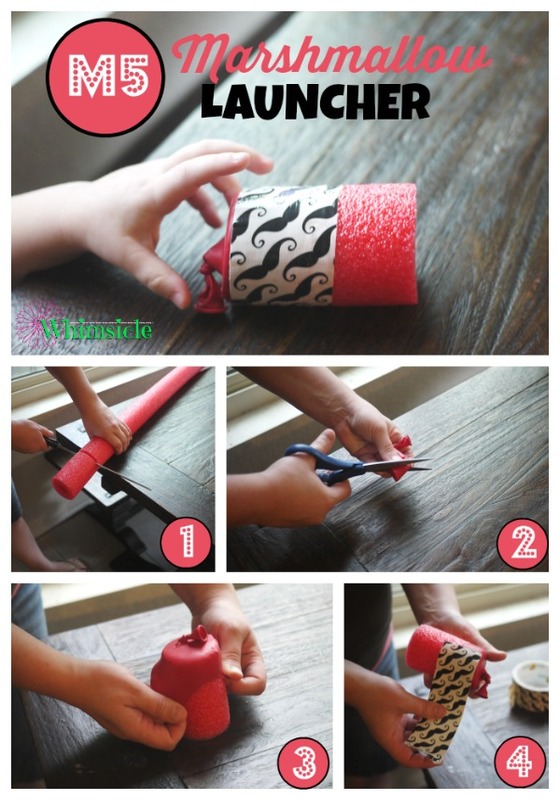 We’ll do this with leftover pool noodles I have from another project. My kids are gong to love it! They are tons of fun Rebecca! Yes Sheila!! Puff balls would work perfectly too!